John C. Fremont, as a young man. UCMP's roots go back 163 years, further back than the University that houses it, or the state that founded the University. It began with John C. Fremont (left). During his military excursions into Mexican California in 1843-44, Fremont collected fossils, and it was his fossil finds (later described by James Hall) that initiated an interest in the geology and paleontology of California and thus led to the start of UCMP's fossil collection. Josiah D. Whitney, the California State Geologist in 1863.
study the geology and geography of the coast from Bodega Bay to San Diego. Both he and Trask found fossils, including microfossils. Trask left geology, but Blake continued his work with the Pacific Railroad Surveys, and Jules Marcou published two geologic maps of the United States that showed California consisting of just a few rock types. 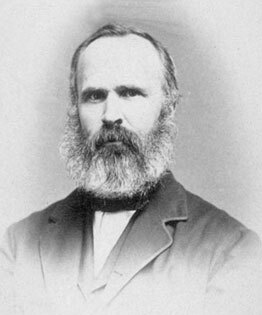 More information was needed, so in 1860, the California Legislature created an official Geological Survey of California with Josiah D. Whitney (above and next page) as the first State Geologist.